Last month, Jaguar gave the XE a mid-life refresh for the 2020 model year, with updated front and rear bumpers, grille, headlights, and taillights that made the sports sedan look even more fetching, as well as a more modern interior. However, the V6 and diesel engine options were scrapped, leaving just a 2.0-liter turbocharged four-cylinder with up to 296 hp and 295 lb-ft of torque. 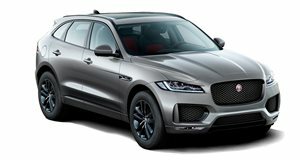 Jaguar has now released details for the 2019 F-Pace SUV, and the good news is that the diesel four-cylinder and supercharged V6 engines will be available for another model year. Styling for the 2019 F-Pace remains unchanged, but Jaguar has upgraded some of the tech. Regardless of the trim, all F-Paces now come with a larger 10-inch infotainment display featuring updated graphics from the I-Pace electric car. Apple CarPlay and Android Auto are also now available as part of an optional Smartphone Package. In addition, the blind-spot monitoring system will now apply a counter-steering force if it detects an object when the driver begins to merge, and the optional adaptive cruise control now has an active steering feature that will keep the car centered in its lane on the highway. For the interior, the SVR-inspired performance seats for the Portfolio trim now have a slimmer design that delivers greater support and additional legroom for rear passengers. Inevitably, these technology updates have hiked up the price for the F-Pace. The base 25t 2.0L turbocharged i4 model with 247 hp now starts at $45,825, which is $2,735 more than the 2018 model. The diesel-powered 20d is $2,475 more expensive with a starting price of $49,775, while the 30t with the more powerful four-cylinder engine increases by $2,475 to $51,275. The V6-powered S trim has the smallest increase of $2,025 with a price of $62,825. The range-topping SVR model powered by a 5.0-liter V8 producing 550 horsepower and 502 pound-feet of torque starts at $81,015 but there’s no price increase since it wasn't on sale last year. All prices include the $1,025 destination charge.